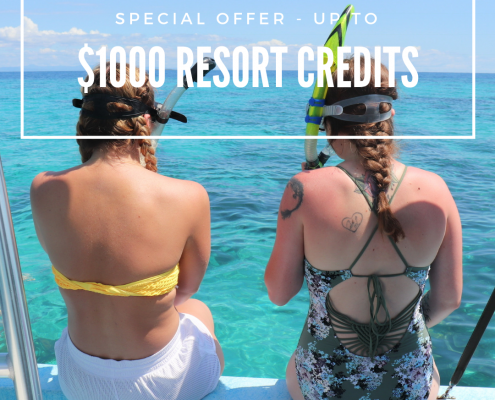 receive up to $1,000 in Resort Credits. Resort credits are like a gift card…use them for any services offered at Sirenian Bay. Spa services (starting at $35), ground transportation ($300 – $550), meal preparation ($25 – $100 per meal), tours booked directly with Sirenian Bay (starting at $85/person). Manatee Villa and Seahorse Villa reservations qualify for $1,000 in resort credits. Turtle Villa reservations qualify for $400 in resort credits. Valid for 2019 stays in any villa. Not valid with any other offer or discount (with the exception of military discount). No cash value. Non-refundable. Not valid on previously booked stays. Active, former, and retired military personnel receive a 10% discount. We are happy to offer at 10% discount on any stay for active, former, and retired military personnel. Contact us when booking to apply the discount! Book a one-week stay and receive a complimentary massage. We are happy to offer one complimentary massage in The Siren’s Spa, located within the Sirenian Bay Resort, with your reservation for one week or more. views from the beach and pier are breathtaking. Have questions about Casa Sunsandsea or Belize?